A Career Opportunity That's a Perfect Fit. 2015 Dealer of the Year. 2016 Installer of the Year. Top 5 largest security company. 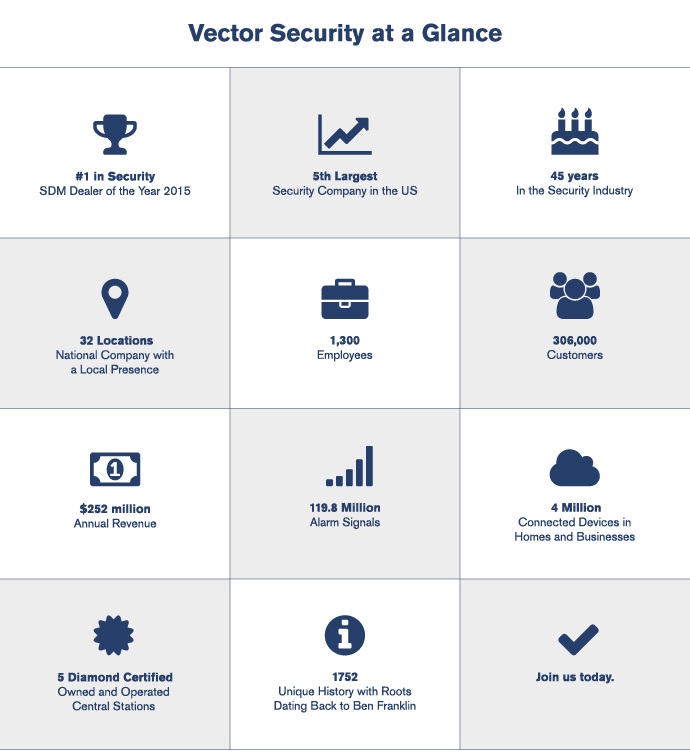 Sure, we’ve got the hardware and the recognition, but the real reason to join Vector Security is our people. People who are passionate about the work they do. Energetic people who innovate, who take on new challenges. People, perhaps, like you. And when we find good people, we hold on to them…through career advancement opportunities, internal promotion, continuing education, and performance incentives. So whether you’re a proven leader in your discipline or looking for new challenges, Vector Security may have the right opportunity for you. We seek driven, proactive, talented individuals who are excited about what the future holds. Because we are. Join us. "I’m lucky to work with some of the best people in the business." "I believe in leading by example because when I push myself, I drive my team. Together, we provide unmatched service." "By responding quickly to each customer’s needs, I help build the trust that allows us to grow with them."